I mean really, in the grand scheme of things, what’s one more unread novel? Back in the wild days before the internet (and, not coincidentally, before I spent 5 consecutive years doing literally nothing but studying books and how to write them), reading a couple novels a weeks came very naturally. Now it’s a big deal if I read a couple a month. Even graphic novels start to pile up; there are 2 on my desk right now, that have been sitting there for 6 weeks. I read 2 graphic novel (digital format) yesterday and one hard copy the week before. Tonight I was trying to finish up this very weird Roger Zelazny book I’ve been pecking away at in my down time all month, but I just couldn’t push through to the end. This week alone, I’ve been sent 2 digital copies of novels I know nothing about, by people whom I have every reason to believe are perfectly cromulent authors whose books are totally worthy of being read, along with 2 hard copies last week, sent by authors I know quite well, of books I’ve already read but need to read again for professional reasons. A couple years back, I spent about 3 months organizing my existing library, which comprises maybe 3000 volumes. It’s very spiffy, mixing a few different systems to suit my needs (most Library of Congress) and incorporating spine labels so I always know where particular volumes are and can always reshelve them properly. But that work doesn’t do anything about the sheer volume of volumes that keep arriving, covering every horizontal surface. I’ve always been OK with being a person who only reads maybe 2/3 of the books she brings home, but lately that number is skewing even less impressively. Maybe if I stopped screwing around on the Internet and playing Pokemon Go, I could clear away some of this work. But that’s not what’s going to happen. What I’m trying to say is that this isn’t a comic strip drawing, but rather an actual image of me in my office. Please come dig me out. Bring librarians. This entry was posted in webcomic and tagged authors, books, comic, overwhelmed, reading, webcomic, webcomics on August 2, 2016 by littledragonblue. Introverts of the world–well, when I say “unite,” you know I just mean emotionally, intellectually, spiritually. I wouldn’t actually ask you to, say, leave your homes or interact with other human beings. What kind of a monster do you think I am? The Internet is pretty much the greatest thing that ever happened to bookish, socially awkward, and otherwise introverted nerds. Now we can interact with other human beings! On their level, even! Sometimes even above their level! Minus all that uncomfortable physical proximity and weird self-consciousness, and without the need to constantly decompress afterward. In fact, people who know me as an adult often have difficulty believing what an introvert I am. I’m not shy, and I’ve overcome most of the social handicaps that really perplexed people when I was a little dragon. I’m perfectly capable of going to a party and enjoying myself, even being the center of attention, although I’ll never master or comprehend the art of small talk. But when I’m done, I’m done. Too many people frazzles my circuits. It probably doesn’t help that many of my friends are significantly younger than I am. The Man and I are both 40, while the Fox and Mrs. White Kitty are in their early 30s and the Otter and Mrs. Black Kitty are actually in their 20s. We probably enjoy a wilder nightlife than most people in our cohort. We get invited to a lot of sweet parties thrown by really cool people. But sometimes, I can’t handle it. Sometimes, all you want is to sit quietly and read, and no amount of funnel cake, legal intoxicant, or whimsical diversion can entice you. The Man is an extravert himself, and would happily immerse himself in group dynamics every night of the week. Personally, I have weeks (this one for example) where I’d be perfectly delighted never leaving the house. It’s draining, and it cuts into my creative time. Of course, the Internet cuts into my creative time too. It’s a delicate balancing act. 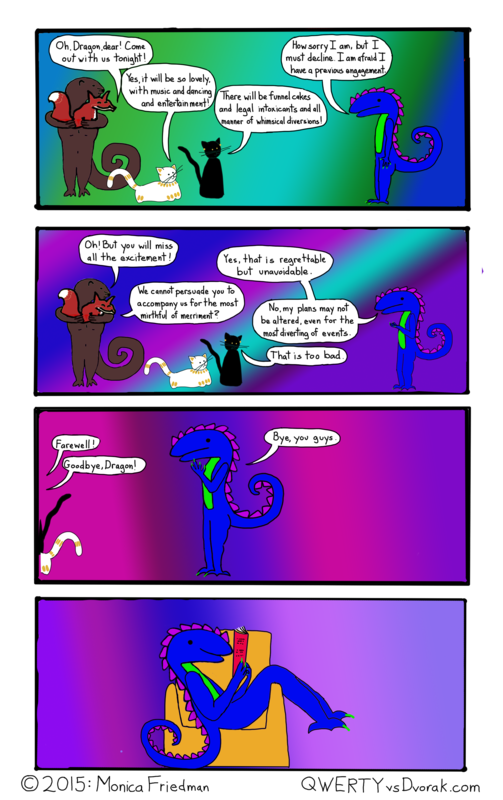 This entry was posted in dragon comics and tagged books, comic, dragon, friends, introversion, introverts, reading, socializing, webcomics on September 15, 2015 by littledragonblue. We didn’t have summer reading when I was a kid. Actually, I read all summer long, but we didn’t have assigned books. It’s hard for me to understand that some kids don’t read for pleasure, despite the fact that both the kids living in my house fall into this category. The Girl probably would, sometimes, but her dyslexia makes it hard. I have no idea what the Boy’s excuse his. He is supposedly a very good reader, but I have never, ever seen him read anything for pleasure besides gaming manuals. Anyway, 6+ weeks into summer break and he’s barely cracked his summer reading book. Considering he’ll be spending a week on vacation in San Diego with his mom, and a week in Seattle on vacation with his dad and me, and that school starts up on August 8th, and the book in question is 550 pages long, he’s really cutting it pretty close. We’ve been bugging him about it off and on, but today the Man cracked down on him. No Kindle until you’ve read a big chunk of that book, he was told. Fifteen minutes later the Man found him hiding in his room, watching YouTube on his GameBoy. Now he’s lost all screen privileges. So now I feel compelled to check. That is, I got my own copy of the book. This morning he claimed to be on page 47. Now he claims to be on page 125. At any rate, I’m somewhere at the 35% mark (mine’s a pdf and it’s paginated differently but I’m guessing I’m probably somewhere around page 175 of the print copy) and now we can all experience the joy and excitement of me going all English teacher on that kid. There will be book talks. I will determine how much he has actually read. He will be prepared, goddamnit. It took me a couple chapters to get into the story, but it’s very beautifully written and I ended up reading much longer than I had intended. However, now it’s 12:30 and there are no comics for your reading pleasure. 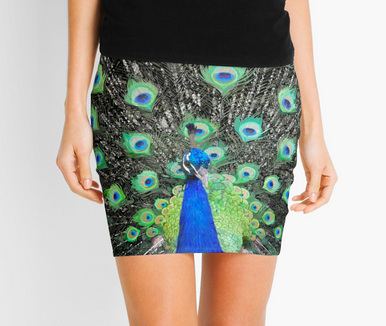 What I have instead, is a couple new product types in my RedBubble shop. It feels like they’re adding new stuff too fast for me to keep up. No sooner have I enabled one new kind of notebook for one product than they introduce a different kind of notebook. This spiral one looks pretty sturdy. It’s 6″ x 8″, 120 pages (ruled line or graph, your choice), and comes with a pocket in the back. Pictured here, My Sister and Brother-in-Law Look to the Future is very timely, as their wedding is fast approaching and my mother bought a bunch of these T-shirts for the grandkids on both sides to wear. I’m working to get all product types available for every design, but it may take a while, since I now have a lot of designs and I also have a lot of more pressing other stuff to accomplish. Like finishing this 8th grade reading assignment and find a wedding present for my sister and brother-in-law. I can’t use this design because that’s what I gave them for their engagement present. 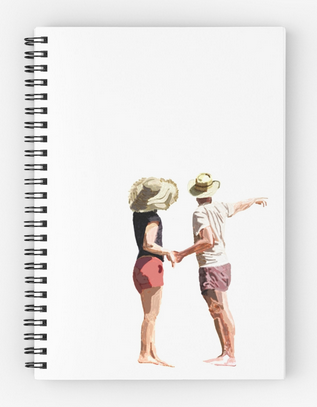 This is a different style of notebook, the hardcover journal. It’s similar in size to the above product, but not quite the same: 5.2″ x 7.3″, with 128 pages. In addition to ruled lines or graphs, you can also order this one as a blank book for a more freeform writing/drawing experience. The image wraps around to the back of the cover, which looks pretty cool. 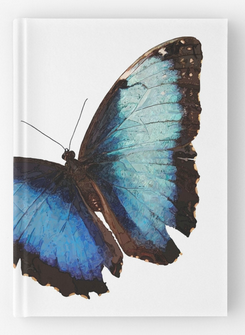 This, of course, is the Blue Morpho design, a painstaking and velvety recreation of one of planet Earth’s most spectacular insects. Although they’re all pretty spectacular if you really open yourself to that sort of thing. I mean, I was strongly considering drawing a comic about the tarantula hawk, a giant local wasp that literally hunts and eats large spiders. They are spectacular in their own way, although not everyone will be filled with awe and wonder at their presence. I can still hear the pained shrieks of the Girl after one flew in the general vicinity of her head 5 years ago. She didn’t stop screaming for about 15 minutes. She only got over the experience about a year ago. But really, they’re pretty cool, for what they are. Draw attention to your middle part. I’m actually sort of torn on this pencil skirt, simply because it seems like only women who are perfectly comfortable with the shape of their legs, hips, and belly would want one, and generally speaking, I don’t know a lot of people who fall into that category. At any rate, this style of skirt in the Vanity Has a Thousand Eyes design is certainly a hugely striking and attention getting way to CYA, if you feel comfortable drawing the gaze of other people to this region of your body. It’s a personal choice, I guess. It comes in 7 sizes from XXS to XXL, and the price is reasonable. There are actually more new products but I shall save them for another update. Some fun things: last night the actual physical human being Matt Paxton, a guy whose wit and wisdom I have enjoyed for a number of years on the horribly voyeuristic and schadenfreude-tastic reality show Hoarders, saw my comic in honor of his superior organizational abilities and retweeted me with a compliment. Then this morning, I woke up to 2 i.m.s, 1 asking me to review the ARC of an upcoming book by an award-winning author I love and have known personally for some years for a website where my work has never appeared, and the other asking me if I would be willing to help someone write their autobiography. It’s nice to be recognized. Although, to tell the truth, I get asked to help someone write an autobiography about once a year and so far no one’s ever written anything. Well, better get back to my middle summer reading assignment. You know that sort of thing goes on your permanent record. This entry was posted in Clothing and tagged books, clothes, designs, kids, notebooks, products, reading, redbubble, t-shirts on July 14, 2015 by littledragonblue. Clearly, this mandala celebrates the raucous chauvinism of America’s Independence Day. Originally, I think I had bigger plans for it, but somehow, just like real fireworks, it was a short display that ended too soon. Probably I should hold it back until July but who knows what the future holds? Today we celebrate the glorious 4th mandala, and that’s that. Yesterday, while I was still reeling from my personal crisis of can’t even, I received the official invitation to become a regular contributor at Panels.net. I didn’t even realize until I skimmed the contributors’ bios that there are a number of really accomplished people affiliated with that site. Illustrious company. Go me. I really do have a lot to say about comics, and I believe I say them very well, thank you. Today was one of the days I read to kindergarteners because it lightens my heart. We read 2 Jane Yolen books. Talk about a gifted writer! How many people in the world could create a story about a little girl being extremely quiet in the woods and end up with something that would keep a room full of 5-year-olds in rapt, delighted attention (Owl Moon)? Plus, the hilarious Recess Queen, which always gets a lot of laughs, as well as a short book about cowboys. I started my new bulletin board but made the mistake of doing the picture before settling on the words. Now I have about 12 tabs open, each with a different quote that might possibly be usefully paired with an image of an exploding volcano. 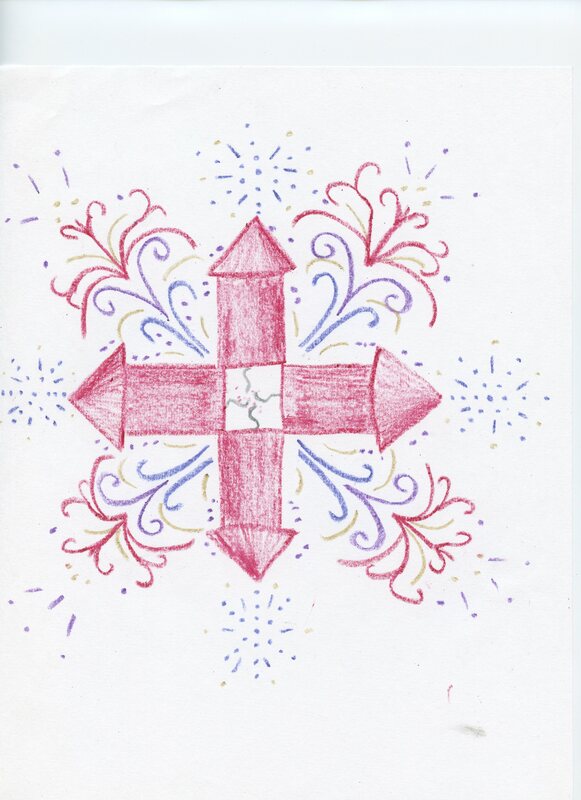 This entry was posted in mandalas and tagged fireworks, holiday, mandala, reading, rockets, stories, writing on March 5, 2015 by littledragonblue.